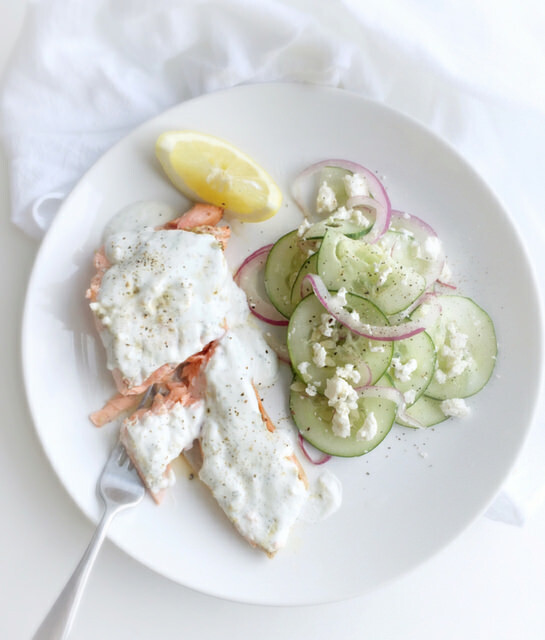 Spread this deliciously creamy nonfat yogurt dill sauce over grilled or seared salmon. 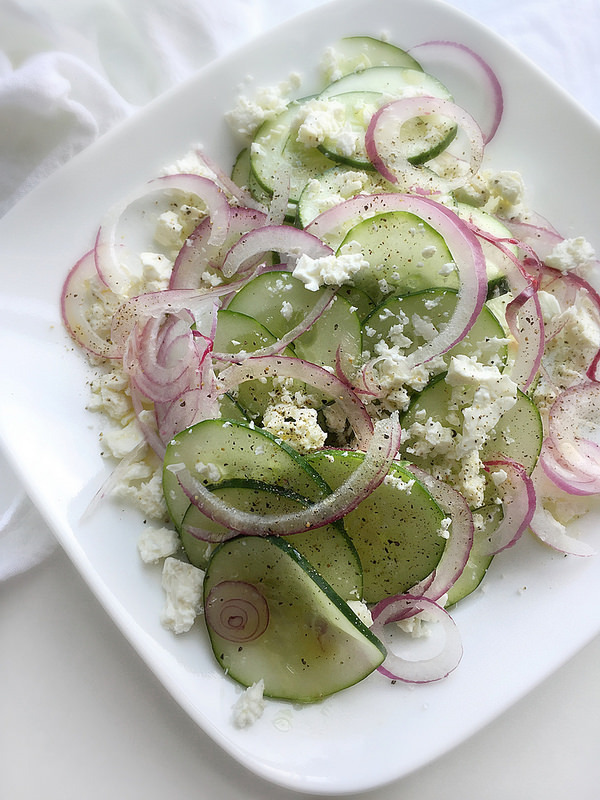 Serve it all with an easy, fresh cucumber feta salad for the ultimate healthy spring or summer meal! You know when you make a meal you’re sure you’ll start making all the time? Something easy enough that it doesn’t require you to buy a million ingredients, but also flavorful and impressive enough that you’d be happy to serve it to friends? That’s my favorite. Does it happen all the time? Ehh no. But when it does, I have to share it with you. Salmon always feels special to me because it’s rich, it’s silky…but buying it wild means paying an arm, a leg, a month’s rent, and one week’s vacation. 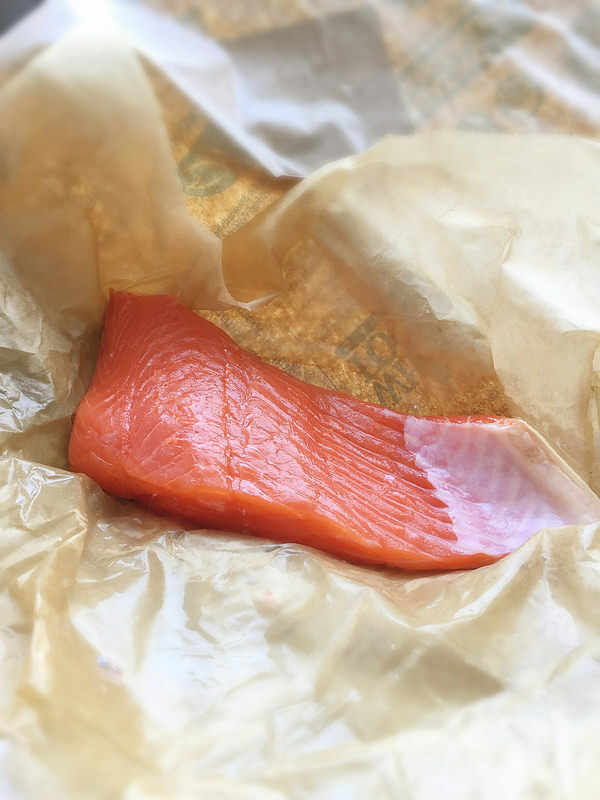 Every time I pick out a gorgeous piece of wild salmon at the seafood counter, I ask myself, “Should I get insurance on this?” You can’t risk bad recipes on that fish. That’s why this one’s a keeper all around — side dish included. For 350 calories, you’re completely satisfied, friends. Trust me. Even when I’m making “plain” salmon that I’ll add a sauce to later, I like to quickly marinate it with lemon juice, a few splashes of olive oil, garlic, sea salt, and pepper — just to add some subtle flavor. One tip: never let fish marinate in something acidic for more than 30 minutes (45 minutes max), or the fish will begin to “cook” and become mushy when grilled, seared, or baked. You’ll see that the outside of the fish turns opaque fairly quickly if left too long. This is how citrus juice “cooks” fresh fish in a dish like ceviche. The dill sauce is a simple stir of nonfat greek yogurt, fresh dill, lemon juice, garlic powder, salt, and pepper. (I use garlic powder here rather than raw garlic because it blends better into a sauce). It’s not quite the same flavor or richness as you might find in restaurant dill sauces that are made with mayo or sour cream, but it’s so light and bright you won’t miss the other high-calorie versions. It’s got a bit of a tang, and using nonfat greek yogurt like I did will give you even more of that tangy flavor, but I love how it pairs with the natural richness of the fish. If you’re not much of a yogurt fan, consider swapping in some or all low-fat sour cream. Cucumber feta salad is my obsession. I considered creating a whole post just for this one side dish — that’s how lovable it is. And it’s such a simple thing, really. The key is to slice the cucumber and red onion paper-thin, then liberally, pepper, and toss with fresh lemon juice and a splash of olive oil. Add a good handful of feta and toss again. I have a feeling you could leave the oil out altogether and the salad would still have that salty, tart, fresh flavor, but it’s your call. Let the salad sit for a bit and the salt and lemon will help to slightly soften the veggies. You’ll love it! 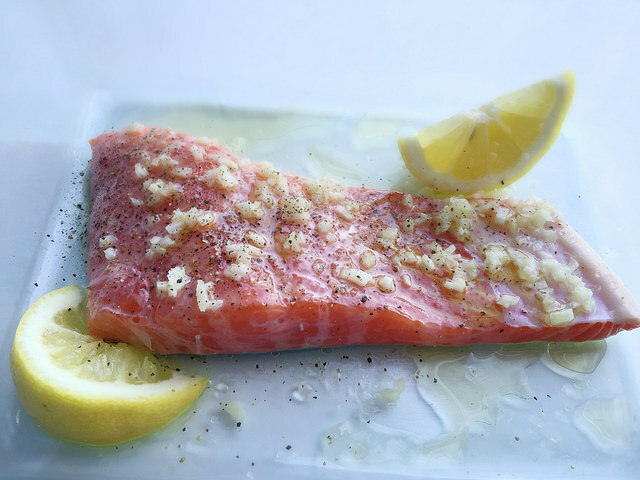 Place the salmon in a baking dish, sprinkle with the fresh garlic, season liberally with salt and pepper, squeeze the juice of half of one lemon over the top, and drizzle evenly with 2 teaspoons of olive oil. Cover the baking dish and place in the refrigerator to marinate for 15 minutes. For the dill sauce, in a small bowl, whisk the yogurt, juice of half of a lemon (1 tablespoon), the dill, garlic powder, and a pinch of salt and pepper. Set aside to let the flavors blend. If you’re waiting longer than 15 minutes before using, cover and refrigerate. For the cucumber feta salad, in a large bowl, combine the cucumber, onion, and feta. In a small bowl, whisk the juice of the remaining lemon (about 2 tablespoons), the remaining 2 teaspoons olive oil, and a pinch of salt and pepper. Pour the dressing over the cucumber salad and toss to combine. Remove the salmon from the refrigerator. Spray a large nonstick pan with an oil mister and heat the pan over medium-high heat. When the pan is hot, add the salmon skin-side-down and cook, without moving, until the sides are cooked halfway up the filets, about 5 minutes. Flip and cook until the sides are fully cooked and the fish feels firm to the touch, about 4 minutes. Oh! Love to see two posts in two days and such great recipes!!!! BUT!!!! !THE BEST news is about you and Daniel. Ahhh love.❤️ I teared up after reading the Instagram. Hold on and love him like no other. My son has had a relationship like this one. It pains me to think they are not together BUT, it is not time. I know they love each other and are soul mates but they will be together or not down the read. Enjoy your love and always and forever tell him. It is important today it as it is to show it. Married 42 years. Love. Gets so much better with age. OMG I just read your comment and had to go find the Daniel post – so happy to hear you’re back together! Posts two days in a row? I love it! This is similar to my favourite salmon recipe with yogurt and dill too – I just add dijon and parsley! I’m so happy you’re back with recipes! I missed them arriving in my inbox :) This looks incredible, just so fresh and summery, love it! Andie this is gorgeous! Even your pics of the fish marinating are so light and fresh! Fabulous! Absolutely gorgeous honey! 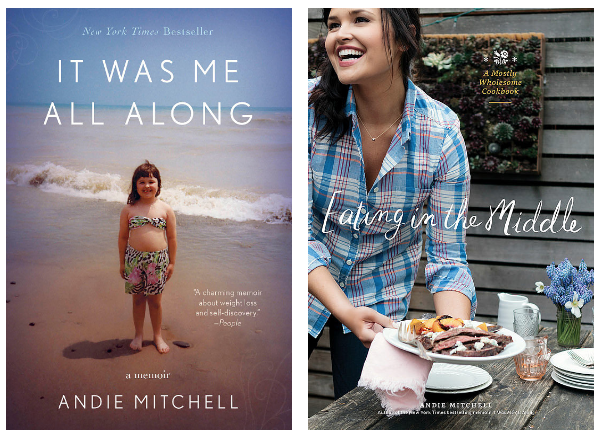 Andie so loved your book!!!! Life changing for sure! Look forward to each and everyone of your posts!!! Please do tell when the cookbook is coming out?!!!! Andie congratulations on the man in your life. No wonder two posts in two days. LOL. This looks fabulous. I had perfected a grilled Salmon in the toaster oven but could never get the pan seared method. Always turned up hard. Now I know. I am loving this Dill sauce. Just read your book… what an inspiration!!! Andie, I haven’t seen the post but am so happy to hear about you and Daniel. When I read your book that was the one thing that just didn’t sit right with me. Although I don’t know you, I just felt like you should be together and maybe one day that would change, so glad that day is now. Muah!